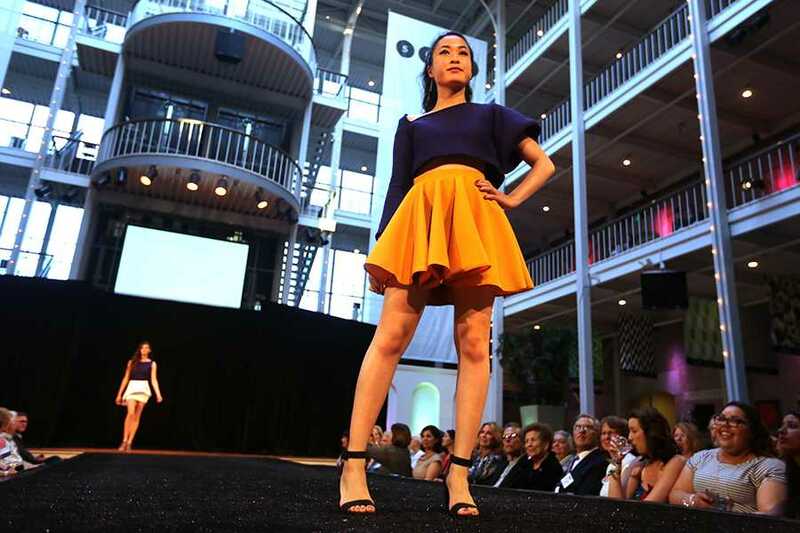 Leather, lace, cotton, chiffon and everything in between graced the runway at the San Francisco Design Center as apparel design students showcased their designs. Runway 2014: Provoke, the 20th annual fashion show, was put on by the Fashion Network Association and SF State’s apparel design and merchandising department Thursday, May 1. DJ Seven maintained the fast pace of the show, spinning music that shifted as rapidly as the models changed clothes. Models strutted down the runway in evening gowns, menswear, bridal wear, sportswear and other one-of-a-kind garments. Each of the 25 lines consisted of four to five looks designed from scratch by senior fashion design students. Liz Zepeda, one of the designers, drew the inspiration for her line from contrasting crocodiles skin and snowy mountain peaks. The avant-garde makeup donned by her models featured geometric lines drawn to resemble crocodile eyes and eyebrows adorned with frosty rock candy. Zepeda described the design process as stressful yet rewarding. It took her two months to complete her line, which offered a blend of diversity and cohesiveness through a white and green color palette. This is her first collection that she has produced, but certainly not her last. She hopes to collaborate with other designers, advocating innovation and creativity to produce one-of-a-kind, made-to-order garments. The show also featured garments that were repurposed from SF State banners and damaged clothing from the University’s bookstore, all designed by students in the ADM major. The goal of the event was to inspire the audience and “provoke” them to think about innovation and sustainability. “It’s basically meant to provoke and inspire people to be creative, and to provoke excitement in the audience,” said Johanna Renkvist, a fashion merchandising student who served as the backstage lead of the show. For Zepeda, the name of the show conjured up ideas of pushing the boundaries of fashion and thinking outside the box. The audience consisted of several hundred alumni, students, family members and fashion lovers, all united by the universal language of fashion.